By the middle of February some people are sick of hearing about romance, Valentine’s Day, gifts, cards, and even love. But can love be over-emphasized? As believers in Christ we are to walk in love (Ephesians 5:2), be rooted and grounded in love (Ephesians 3:17), follow after love (I Timothy 6:11), and put on love (Colossians 3:12-14). Can we talk about it too much? Love is a consistent theme throughout the entire Word of God. The greatest command in all of scripture is to love the Lord our God with all of our heart, soul, and mind. The second command is to love our neighbor as ourselves. Jesus said that, “On these two commandments hang all the law and the prophets,” Matthew 22:40. To put it differently, the entire Bible can be summed up with love. 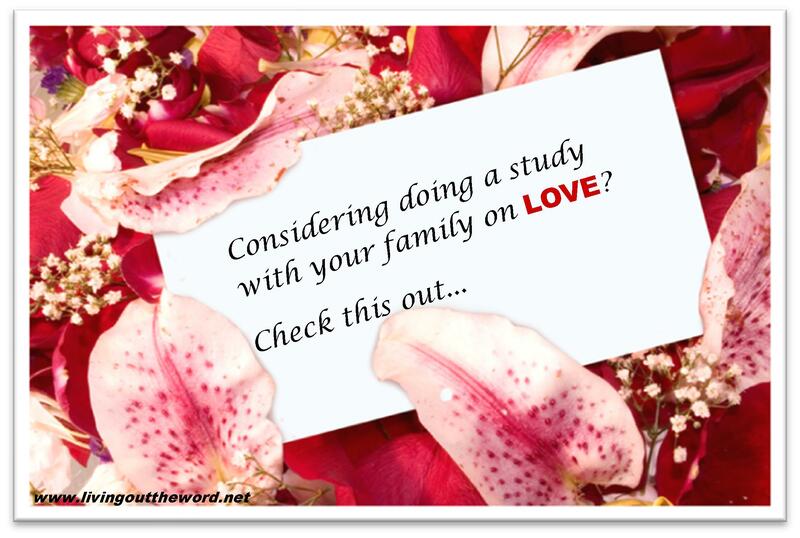 Love is a wonderful topic for study and February is a great time to gather your family up for such a study. A good place to start is with the writings of the Apostle John. Love envelops his epistles. In 1 John alone we see 46 different forms of the word love. Let me share just a few truths about love that adorn these inspired epistles. If you would like an additional resource for personal use or to use with your family consider getting a copy of Love: A verse by verse study through the Epistles of John. It is a study that dives into the deep truths of God and His great love.